Stockholm's storied Grand Hotel is set on being one of the top-ten luxury hotels in Europe by 2015, and recently offered a rare, behind-the-scenes look at a set of newly renovated suites that owners hope will help it get there. Ever since its opening in 1874, Stockholm's Grand Hotel has been the hotel of choice for celebrities and well-heeled visitors during their stay in the Swedish capital. At the time of its opening, the Grand boasted more bathrooms than the Royal Palace situated across the water on Gamla Stan. 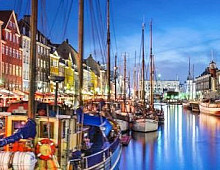 The hotel also played host to the first ever Nobel banquet back in 1901. 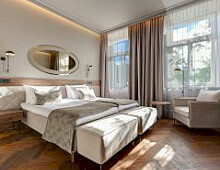 As the city's only five-star deluxe hotel, the Grand has long offered amenities unavailable at other Stockholm hotels such as eateries run by Michelin-starred chef Mathias Dahlgren. But more than 125 years of history had left some aspects of the hotel somewhat below the standards expected by the types of guests that frequent Europe's five-star hotels. "The rooms themselves were actually something of a weak point," Grand Hotel sales manager Martin Gunnarsson told reporters during a recent tour of the hotel. 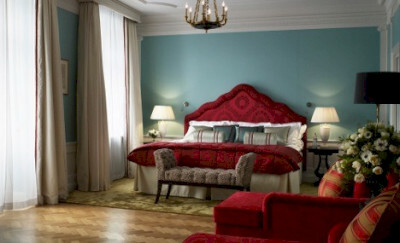 However, the Grand has been taking pains to renovate its rooms over the last ten years, and last month unveiled the most recently updated set of luxury suites that it hopes will help raise its stature among Europe's top-flight luxury hotels.